Schneiderlin: "I want to be like Keane"
Morgan Schneiderlin said he aims to emulate Roy Keane and become as a pivotal a figure for the club as the Irishman was during his 12-season spell at Old Trafford. Schneiderlin, signed from Southampton for £25m earlier this summer, has been one of United’s best players in their first three games of the season, displaying the kind of form that has seen going from League One to become a France international. Despite a promising start to his United career, the Frenchman has set the bar and wants to emulate the impact of the former United captain. “I hope to become like him [Keane] because he was a legend,” Schneiderlin said in an interview with France Football. “He has a different personality from me. I speak less on the pitch. Aside from his admiration for Roy Keane, the former Southampton man revealed he “adored” Eric Cantona. “I have seen videos of him,” he said. “I adore him. I love footballers who have character, personality. You need players like that. Cantona says what he thinks. I would love Schneiderlin to have the same impact as Keane, as he says, he’s a different personality, and that might not be a bad thing. 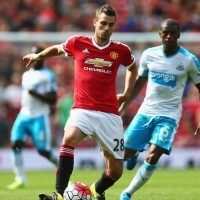 Keane was right for his time, I hope Schneiderlin gives Utd what they need in the present.